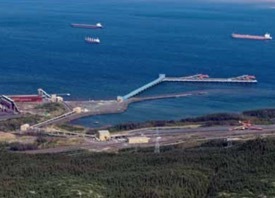 The Port of Sept-I^les has announced that Societe ferroviaire et portuaire de Pointe-Noire (SFPPN) has retained local contractor Groupe G7 to build the conveyor that will link the multi-user dock to SFPPN storage facilities. This local contract, a ZAR 195 million investment on the part of SFPPN, is in keeping with the agreements stipulating that users of the multi-user dock are responsible for linking it to their storage facilities. This new regional infrastructure project follows on the December strategic agreements between SFPPN and the Port of Sept-I^les setting out the terms and conditions for priority construction of the conveyor. “We’d like to acknowledge the Quebec government’s leadership in helping ensure that the contract benefits the region by going to a local company. Government investments at Pointe- Noire in recent years show that Quebec is attentive to the region’s needs and realizes the importance of supporting the iron mining industry,” said Pierre Gagnon, CEO of the Port of Sept-I^les. Boasting diverse, state-of-the-art facilities, the Port of Sept-I^les is one of North America’s largest ore-handling ports, with an annual volume of close to 25 million tonnes.The port facilities at Sept-I^les play a vital and strategic role in the economy of Eastern Canada.Annual economic impacts are estimated at nearly ZAR 13 billion and almost 4,000 direct and indirect jobs.